Musings on spirituality, cooking, Finnish and Italian heritage, and life. I'm reading An Everlasting Meal by Tamar Adler. Well, not just reading. Devouring. Nibbling. Savoring. I couldn't bear to read this book quickly. Slowly doesn't work, either. I take a bite and chew thoughtfully, sometimes a whole chapter in a sitting, other times reading a few paragraphs and then thinking. I just finished chapter three for the second, but definitely not the last, time. This is not my usual approach. When I re-read it's usually for the pleasure, not the ponder. I want to remember the plot and characters again. But reading this book has been as much about feeding my soul as it has been about feeding my family. I first read How to Stride Ahead in the midst of the neverending summer heat wave, simultaneously inspired and repelled by this Bay Area resident describing her Sunday afternoon ritual of roasting vegetables for the week. At the time, the thought of simply turning on the stove was horrifying. Turning on the oven was a nightmare I just couldn't face. The days are cooler now, and for the past two weekends I've engaged in this ritual of chopping and tossing and tasting. I've done something like this before, with heads of lettuce. I'll tear up and wash a whole head and then my go-to veg is done for the week. But there's no variety there and I cross my fingers every time I open the salad spinner, hoping the leaves haven't wilted yet. Roasted vegetables are so much more forgiving. You chop one at a time, throw them in a pan, toss with the essentials (olive oil, salt, pepper) and pop in a hot oven. Adler says they're done not when you wonder if they're done, but when you reach in to taste another. We eat them at room temperature. 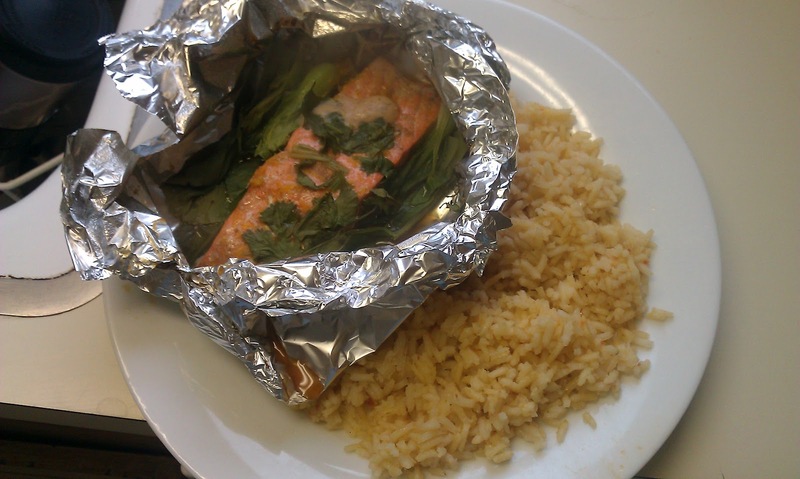 I take them out before I start cooking and put them wherever it's warmest to take off the chill. At dinner, we just pass around the plate (last night it was broccoli, celery root, and cloves of garlic--which you don't even need to peel until they are on your plate!) and take what we want. Easier than a salad. She also converted me on kale. Legitimately. You roughly chop it, cover it halfway with water and a half cup of olive oil, then sprinkle with salt and pepper. Let it cook until it's ridiculously tender, then puree (I love my stick blender for this). I boiled off the remaining water, then spread ricotta on a slice of the bread I baked yesterday, plopped the kale on top and was satisfied in a way I have never been with kale. I love this book and I love this ritual. I must spend more time on this chapter, looking at its different facets. I want to own the jewels within its pages, to have them belong to my soul and not have them just be someone else's ideas. I want to know that there are many ways to get a vegetable on the table each night. One of the reasons I started canning was to make my own convenience foods. Yes, I love to cook, but not every night. Also, I'm a fan of being able to pronounce most of what I put in my mouth. 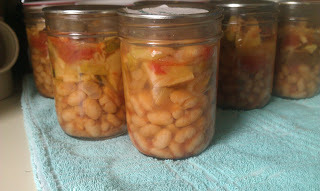 That, combined with the frugality of making one's own canned soup, has had me plotting to make minestrone for several months now. The only problem with minestrone is the chopping. Oh, lordy-lordy, is there chopping! Chop the cabbage. Chop the carrots. Chop the onion small. Chop the potatoes bigger. Buy a can of chopped tomatoes to save a teensy bit of time. I've actually come to the point where I don't mind chopping too much. When I was little, I was pretty sure that I would go over to my parents' house once a month, have my mom chop up a big pile of onions, and then I'd store it in the freezer. But now I've come to see it as an inevitable part of life, one that is not necessarily an evil. Sure, I save big chopping jobs for when I know I'll have a good chunk of time to not be rushed into amputating a digit, but I like the process, too. 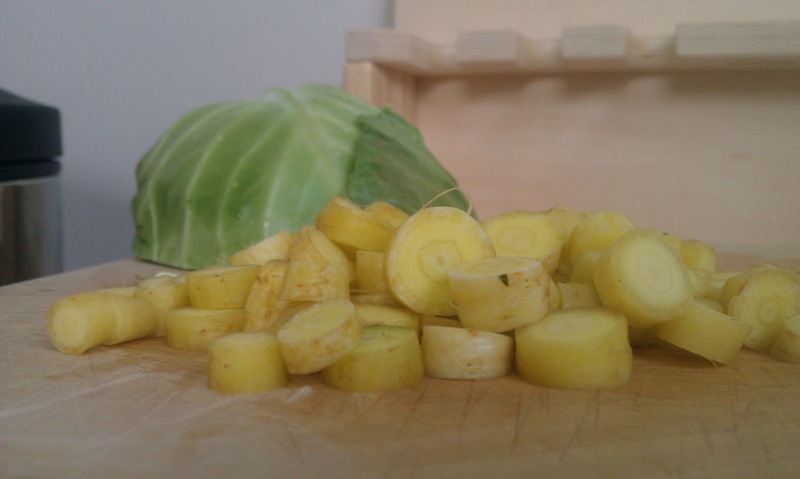 Chopping vegetables is a nice time to think. There's a little bit of distraction from real life as you plot how to get a tapered carrot into even pieces. But there's also that time where you just get to chill. You can tell your kid that you're busy, not because you need to check Facebook, but because you are making something delicious for him to eat. There's no guilt in chopping, just the sound of knife through vegetable on wood. This past week we joined our fourth CSA. I desperately miss our San Francisco CSA, with its dirt-clodded potatoes and jars of local honey. The previous CSAs we've belonged to in Southern California have both featured an abundance of chard and kale, two of my least favorite vegetables. And let me tell you, "abundance" is putting it nicely. Just so you know: there are a lot of vegetables I don't like. Leafy greens are not the only veggies that I'm hating on. But a CSA gives me the opportunity to see things differently, or at least learn to accept those which I normally abhor. 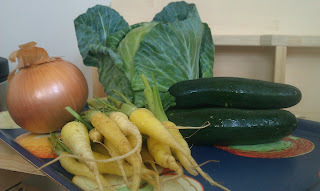 I'm hopeful about our latest CSA. Silverlake Farms has teamed up with other local farms and The Market on Holly to bring a new CSA to Pasadena--this time with an abundance of choice (and I'm using "abundance" in the best possible way). Yes, I still got a bunch of kale, but it's just one bunch, and I was able to choose between red or purple (purple). I got to choose between cauliflower, broccoli and zucchini, as well as between Japanese turnips, Easter radishes, and bok choy. 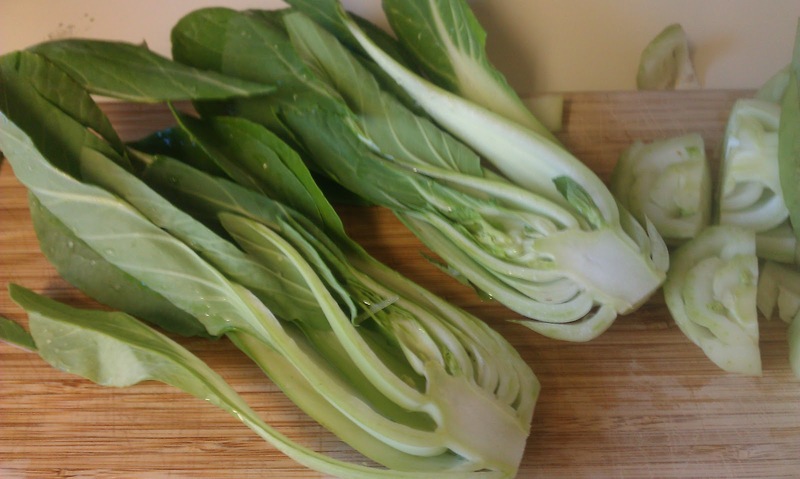 Bok choy was definitely the lesser evil. Looks almost tasty, doesn't it? 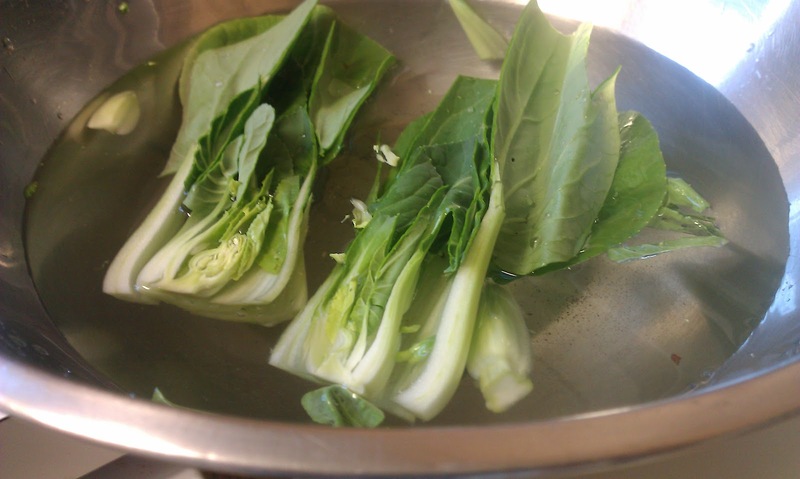 Normally, I chop up my bok choy really small and throw it in a bowl of udon. Then I'm eating it and the crunch is only a slight distraction from the slurpy goodness of those thick noodles. This time, however, I wanted something that, well, maybe, I might actually like. Yay for Epicurious! 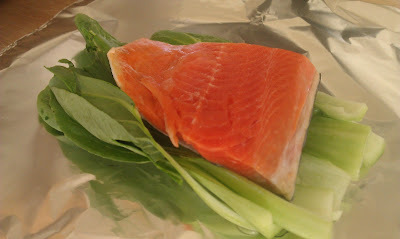 Salmon with Hoisin, Orange, and Bok Choy was ridiculously easy and ridiculously tasty. 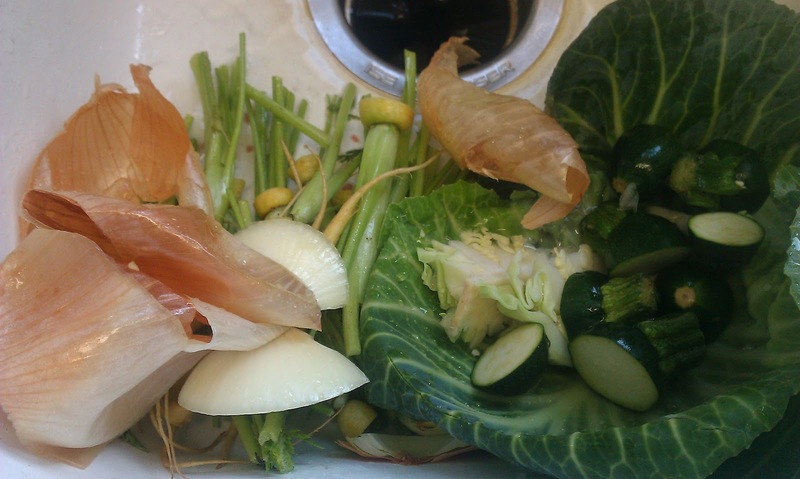 I started with a quick rinse of the bok choy, since slicing it lengthwise revealed some pretty gnarly dirt. Dip it in a bowl of water so you can swish while the dirt falls to the bottom. 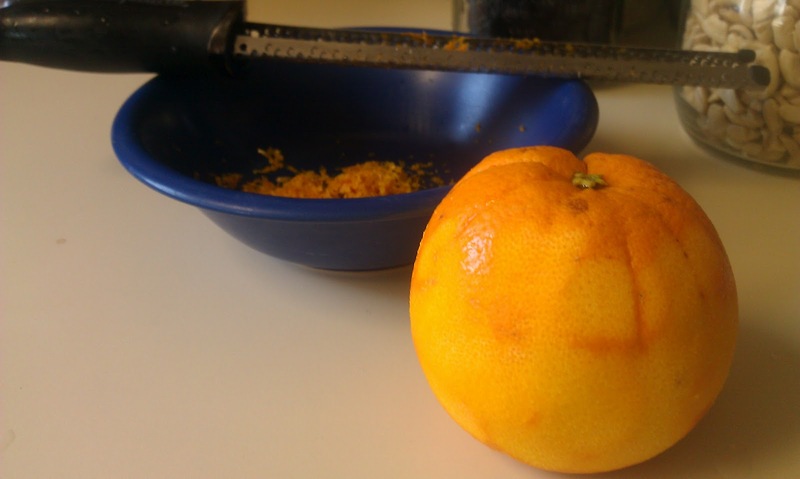 Then I whisked up a quick sauce of a little soy, two generous tablespoons of hoisin (I LOVE hoisin sauce), a healthy dose of grated ginger (I peel a root and keep it in the freezer) and the zest and juice from an orange that was also in the box. Drizzle that over the salmon, top with chopped cilantro from the CSA box, and wrap up tight. The bok choy had practically melted. 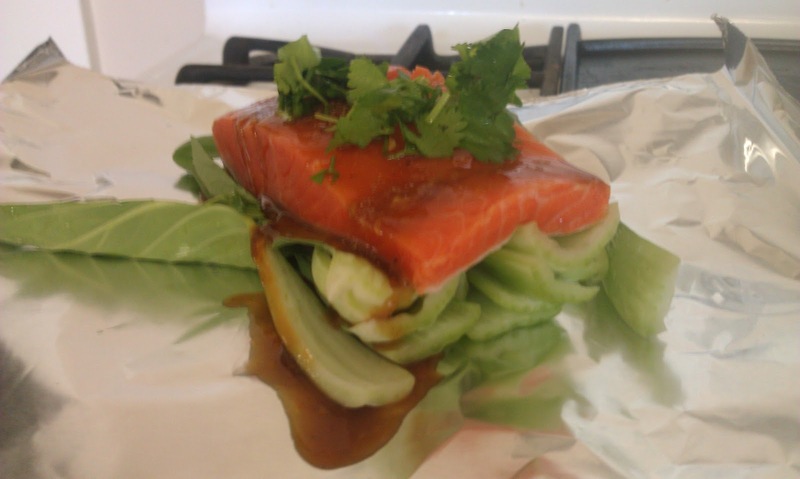 The orange-hoisin sauce made it delicately sweet and tangy. It was all right. Everything was all right. The struggle was finished. I had won the victory over myself. 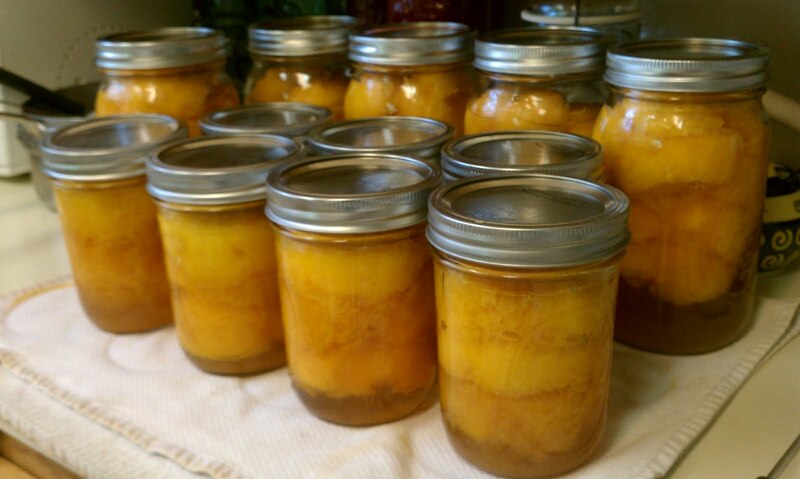 In the beginning, peaches grew on trees. Now the peaches were ripe and ready, but they would not be fresh forever, and the smell of peaches at the farmers market wafted over me. And I said, "Let me take them home, fifteen pounds of them," and take them home I did. I saw that the peaches were good, and I separated the peaches from the peels. 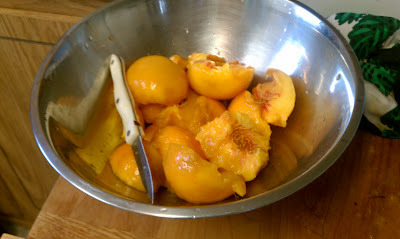 I called the peaches "tasty" and the peels "fuzzy." 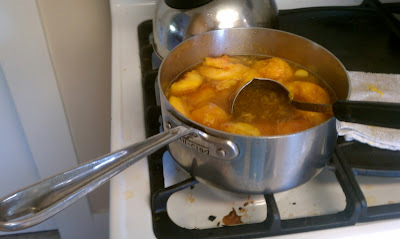 And there was dipping of peaches into boiling water then cold water as the peaches were skinned--the first step. And I said, "Let the peaches be separated from the pits." 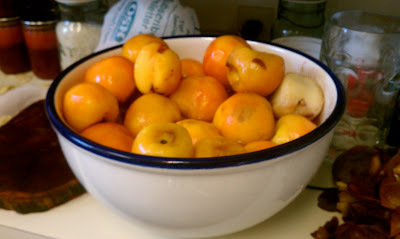 So I took a knife and carved the flesh from the pits and was thankful these were freestone peaches. And they were separated. I called the flesh "halves." And there was a bowl of halves and a pile of pits--the second step. And I said, "Let the little one entertain himself." And it was so. The little one called the toaster "fun" and the bag of chips "tasty." And I saw that it was good. Then I said, "Let the peaches be heated in an apple juice syrup, and when I run out of that a sugar syrup will do." And it was so. The peaches heated a single layer at a time, according to the directions. And I saw that it was good. There was heat and there was a ladle--the third step. And I said, "Let the peaches go in the jars--the book says fifteen pounds should make five quarts." But it turns out I filled up seven more pints. I made two layers in my canning pot--one layer of quart jars and one layer of pint jars. I filled the pot with water. I set the jars in the pot as I filled them. And I saw that it was full. There was an an empty bowl where the peaches used to be and a full pot--the fourth step. 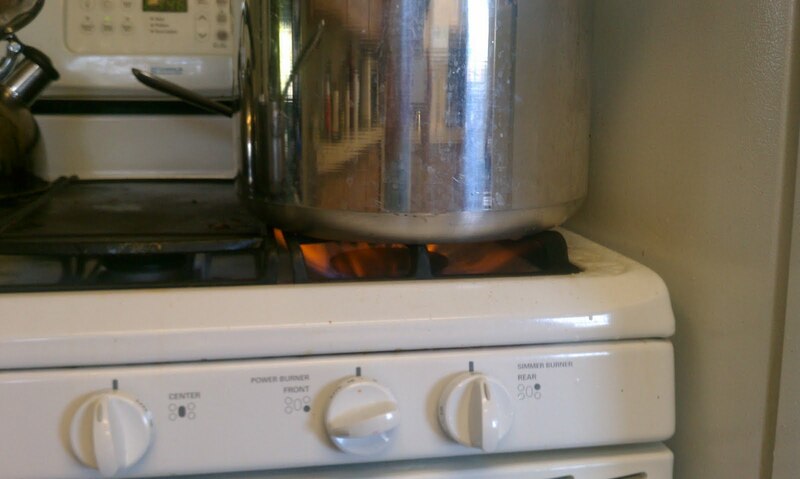 And I said, "Let the pot teem with water, bubbling over and onto the stove." So I cranked up the heat and put on the lid and tried to keep the fire from going out. The flame raged, according to its strength, and the water boiled and bubbled, according to its strength. And I saw the flame go out and panicked. I said to myself, "Maybe I should move the pot to a different burner and mop up the water so I don't fill the house with gas and blow us all up." And I slid the pot over and turned up the heat--the fifth step. And the little one demanded, "I'm bored, according to my kind! Let me into the baking cupboard to play." And it was so. 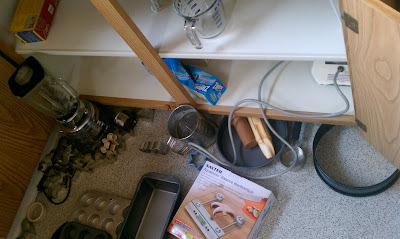 The little one took out the blender and put it together, according to its parts, and emptied out the muffin tins and cake pans according to his desires. He pulled everything out that was interesting to play with. Then I said, "At least you are out of my way." 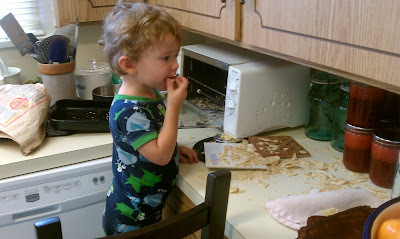 And the little one was a busy as his mommy, just like his mom he kept himself occupied. I looked at him and said to him, "Have fun and keep out of my hair; make sure you don't burn yourself on the pot. Glad there's nothing sharp in there." And it was so. And when the timer beeped, I saw all that I had made, and it looked very good. 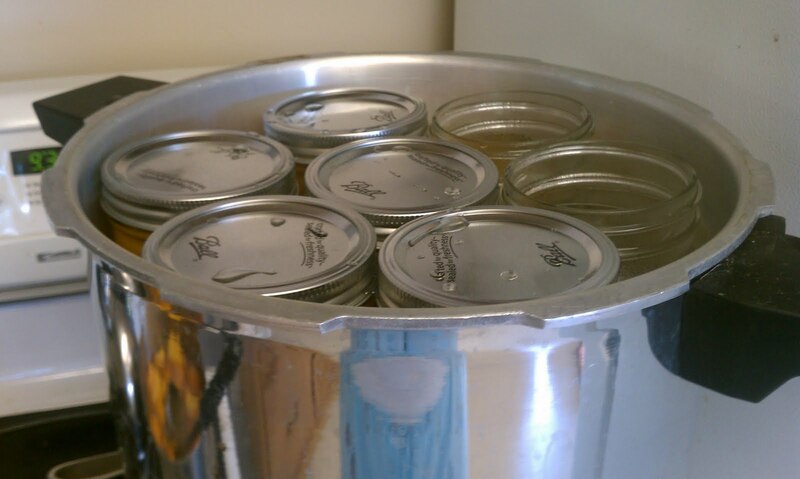 And I took the jars out of the pot and placed them on the counter--the sixth step. Thus the five quarts and seven pints were completed in all their vast array. I had completed all the canning I desired; but the seventh step was to tidy the kitchen. Oh well. Bake. Hope. Eat it anyway.